To deal with this situation and bring about strategic change, the role of the treasurer came into focus. Treasurers were no longer just cash and liquidity managers. They became business leaders and risk managers overnight. From Basel III to CRD IV. Post-financial crisis regulatory changes have brought about challenges that have put the treasury department at the center of corporate compliance. On their quest for speed, security and efficiency, treasurers are now facing additional hurdles, slowing down their ability to add value to the operational divisions of the company. Complying with these regulations has become a full-time job and as treasury departments gather more data for regulatory reporting, they are being presented with greater operational and technological challenges. Recognizing that innovative technology is high on the agenda, FinTech (Financial Technology) companies are progressively reshaping the corporate treasury landscape with solutions which focus on more niche requirements. What has been missing for around a decade is an automated, data driven solution to help deliver new treasury strategic goals – and the FinTech answer to that is a Cash Management Platform (CMP). It’s tough being a treasurer nowadays. So how is technology making it easier? The role of Corporate Treasurer has evolved significantly over the last decade. In addition to traditional treasury activities, treasurers and treasury practitioners are taking greater responsibility for financial risk management, regulatory reporting, as well as playing a more strategic role in corporate activities. With the treasury function increasingly seen as having a unique set of skills to improve the bottom line, treasury departments are now called upon to help add value above and beyond cash management. For the modern-day treasurer, technology has helped reduce the burden and relieve those niggling treasury pain points. So, how is digitization helping? Multi-bank cash visibility – Tired of creating numerous spreadsheets and spending hours reconciling to garner some level of sanity over cash visibility, industry professionals are now turning to technology to help them get a better picture of their company’s cash position. By using tools such as a CMP, treasurers can gather cash positions and report on liquidity requirements in real-time, which is particularly important for organizations dealing with multiple banking systems and subsidiaries across the globe. Coordinate and configure data – Analysts spend hours every day trying to patch together data so treasury and financial professionals can act on advice – only to then start all over again the following day. Technology has turned this process on its head with data now available in real-time and all configured by bank provider, currency, country and even on an organizational legal entity basis. Detection – With finance data overflowing and information coming in and out concurrently, detecting anomalies and missed opportunities is impossible when you’re using a spreadsheet treasury model. Luckily for treasurers, technology is now available at their fingertips to help them make quick changes, which means they’re less likely to miss opportunities to save or make money. Minimize Loss – Never has there been greater justification for a firm to minimize losses, than today. A volatile macroeconomic environment, unstable foreign exchange and negative interest rates all highlight a need for better reporting. Digitization has made this process easy. Today, treasurers can automate reports that allow them to minimize losses with minimum effort, enabling them to act on their findings in a proactive and positive way. Sweeping – Treasurers looking to maximize interest, minimize cost of borrowing and improve liquidity, concentrating all their cash into one account where the interest is at its highest is a great way of managing cash. Without the latest in treasury technology, this process would require routine manual input of payments, which is both error-prone and difficult to maintain. However, through a CMP, the process can be automated as it integrates directly with the payments engine and therefore removes the need for manual sweeping. Analysis – To understand the structure of the finance and treasury function, treasury departments gather information daily about the company’s cash positions by region, currency, bank and legal entity. The task can usually take a large proportion of their day, time which they would rather spend analyzing the data. Digitization has shifted the treasury role away from data gathering to data analysis and strategy execution, as all these routine tasks can now be automated. On-demand – Treasurers have to jump over many hurdles to produce reports that contain accurate and up-to-date information on current cash positions or future liquidity forecasts. However, with real-time information available, these tasks become easy as bespoke organizational reporting requirements can be configured and delivered on demand. Adoption of tech across business – More and more organizations are setting up subsidiaries across the globe. Globalization, international trade and the internet have led to endless opportunities to expand the organizations footprint. Yet, treasurers are the ones left to deal with an increased numbers of foreign exchange transactions, financial risk management, compliance and regional and international regulations. Consequently, treasurers are demanding greater functionality from their technology to meet these demands – tools which track cash positions, manage fund transfers and allow them to take appropriate action to measure and manage risk exposure. Future proofing treasury – We’d all love to see the future today, so that we can build a better future for tomorrow. Treasurers are no different. Having lived through the good and the bad, one thing is for certain: all signs point to a corporate treasury department of the future with even more responsibilities. Financial regulations, the banking environment, payment systems and international trade policies are all set to change the treasury and finance landscape. To keep up with the pace of change, treasurers are looking to future proof their systems to reduce future risks and improve the functionality of the treasury departments. Digitization: Is it the Treasury Utopia it’s made out to be? Will technology deliver the dream for treasurers? Not to sound like a gloomy Gus, but like all technological innovations that have promised an idealistic future there are sure to be complications along the way. Today, the treasury environment is at crossroads of enormous technological change, however the future looks both exciting and murky. While technology holds all sorts of promises for solving the treasury problems of tomorrow, when these technologies are fully realized, what will the treasury environment look like? Will we get many Google Glasses, before we get another iPhone? Whatever the industry, technological change is something that brings with it complications. Technology that answers a problem and relieves a treasury pain point will no doubt be adopted – Why wouldn’t you make your job easier? Right? However, as more and more treasury tech adoption takes place, will we see more security and efficiency problems? Will system interoperability muddy the water? These are just some of the complications that arise when technology makes inroads into business process reengineering. Historically the treasury clash has been between choosing an Enterprise Resource Planning (ERP) software module, which provides the functionality of a Treasury Management System (TMS), or choosing a TMS outright. However, with the arrival of intuitive FinTech treasury software alternatives such as Cash Management Platforms (CMP) and Application Service Providers (ASPs) offering clients access to TMS style software-as-a-service, as well as payments systems and other financial services applications that go alongside, treasurers are being offered even greater choice. With treasurers trying to derive optimum value by choosing a combination of these solutions, getting the mixture correct is key to the success of the treasury department. After all, the purpose of treasury technology is to make treasury operations more secure and efficient, freeing up the treasurer’s time to focus on making strategic decisions. For treasury departments, with an increasing number of software options, comes the challenge of managing multiple data points, numerous logins and even third-party access to data. It’s a challenge that is multiplied when the requirement is real-time, global and there’s more than one legal entity involved. Where will you host the data? Remember, there are international data privacy legislations applicable in key jurisdictions governing where data is gathered, processed and stored. As a result, getting it wrong could lead you into a lot of trouble with the law. How will you control access to data? Who will take responsibility if there’s a breach? Whichever way you decide to digitize your treasury departmental functions, one thing is for certain; security and data is going to be on top of the agenda – and getting it right is going to be key. Focus on digitization of treasury directly correlates with the ever-expanding role of the corporate treasurer. By looking at the roles and responsibility of a treasury and how technology plays a significant role, it’s clear to see they go hand in hand. In order to meet the demands of this new role, technology will have to develop too – and that’s exactly what we’re doing with BankSense. 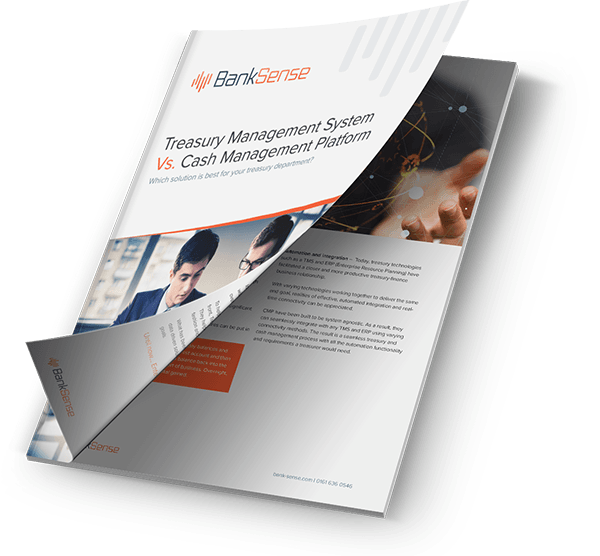 A real-time cash management and analytics tool, BankSense is a Cash Management Platform (CMP) aimed at meeting the needs of treasurers of global corporations. The innovative product by gives treasurers one point of access to their entire banking universe, regardless of where they operate. The CMP lets users view cash positions in real time by bank, by region and legal entity, enabling them to deploy cash moves across accounts and optimize the value of their company’s capital. Launched formally at EuroFinance 2017 in Barcelona, this new product is set to provide the essential intelligence treasurers need to optimize their cash, providing full visibility of interest earned and saved – enabling treasurers to measure performance and plan future sweeping strategies. SWIFT gpi, the new standard for cross-border payments, combines real-time payments tracking with the certainty of same-day settlement. Since it became available in January 2017, 20 global transaction banks have come on-board, exchanging tens of thousands of gpi messages over SWIFT every day. To ensure the maximum benefit to the wider financial community, SWIFT invited FinTech companies from around the world to develop new overlay services that leverage its platform. AccessPay was successful with its innovative proposal, designed to enhance visibility of in-flight cross border payments for corporate customers. AccessPay is now working with SWIFT and gpi banks to bring its concept to life and is co-creating innovative overlay services over SWIFT gpi rails for the benefit of the corporate treasurer. *AccessPay is the parent company of BankSense. Curious to find out more? You can book a meeting with any of our treasury and finance specialists, who will be happy to meet you for a coffee at SIBOS 2017 in Toronto.